Mardi Himal is the name given to the attribute of the long rising ridge and its summit that from the southwesterly lower slope of Mount Machhapuchhare, the famous triangular skyline that is attractive seen from the Phewa Lake at Pokhara. Mardi Himal peak is located in the east of the Modi Khola, across the valley from Hiunchuli. It is separated from Machhapuchhre ridge by a col. and the usual route of ascent reaches this Col and reaches the summit via a route on its east flank. Mardi Himal is one of the striking and beautiful treks in Nepal, uncrowned terrains providing the golden chance to explore traditional villages, incredible scenery, infinite and diversity of culture, spectacular views of silvery mountains and tempting views of the river and exotic valley can be seen on the way of the trekking trail. Although Mardi Himal is the shortest and probably the easiest of our trekking in Nepal, maximize both your pleasure and your chances of success, you need. It therefore makes a visit to the Himalaya a real possibility for those who hither to have not been able to find the time to join a longer trekking. We have two optional itineraries; one itinerary begins Mardi Himal trek from Hangja 1070 meters half an hour drive from Pokhara. The trek reaches and then follows the Mardi Khola for 2 days before turning and climbing the ridge line for 3 more days before reaching base camp. 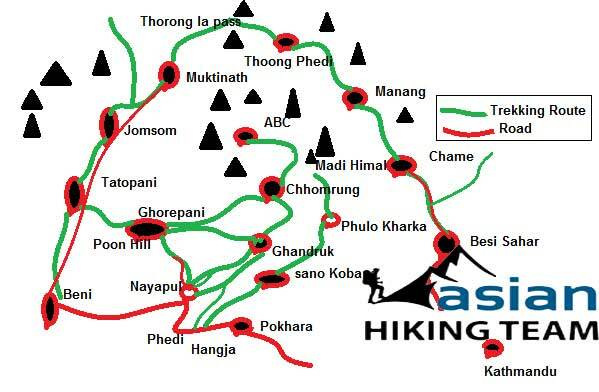 There is another way to visit Madi Himal trekking starting from Dhampus Phedi or Kade. We will bring you Forest camp continues to to Mardi Himal Base Camp 4100 meters than returning the same way to Pokhara within 6 days. It is available basic lodge during the peak season but if you are planning to visit in the off season we need to check. If you are planning to start from Hangja and east base camp we need to prepare camping. Trip High-Light: Tourist Paradise city Pokhara, Best panoramic view, Cultural villages, Dency Rhododendron forest,Surrounding by towering snowy peak, flora and fauna, beautiful view of Fishtail. Day 01: Drive from Kathmandu to Pokhara, 200km, 6 hours drive. Stay overnight at the hotel in Pokhara (BB). Day 02: Drive from Pokhara to Hyenja half hour and trek to Gyachok 4-5 hours. Stay overnight at camp (B/L/D). Day 03: Trek from Gyachok to Sano Khoban (1600m) 5-6 hours. Stay overnight at camp (B/L/D). Day 04: Trek from Sano Khoban to Pipa (3150m) 4-5 hours. Stay overnight at camp (B/L/D). Day 05: Rest day at Pipa for acclimatization. Stay overnight at camp (B/L/D). Day 06: Trek from Pipa to Thulo Kharka (4120m) 4-5 hours. Stay overnight at camp (B/L/D). Day 07: Trek from Thulo Kharka to Mardi Himal Base camp (4100m) 5 hours. Stay overnight at camp (B/L/D). Day 08: Trek from Mardi Himal Base Camp to Korchon (3680m) 4-5 hours. Stay overnight at camp (B/L/D). Day 09: Trek from Korchon to Riban (1780m) 5 hours. Stay overnight at camp (B/L/D). Day 10: Trek from Riban to Hyenja 4 hours and drive from Hyenja to Pokhara half an hour. Stay overnight at hotel in Pokhara (B/L/D). Day 11: Drive from Pokhara to Kathmandu, 200km, 6 hours, transfer to hotel (BB). Day 01: Kathmandu to Pokhara by Tourist bus 6 hours drive, 200km overnight at hotel (BB). Day 2: Pokhara to Phedi half an hour drive and trek to Deurali 2000m, 5-6 hours, overnight at hotel (B/L/D). Day 03: Deurali to Forest Camp 3050m 4-6 hours, overnight Lodge (B/L/D). Day 04: Forest Camp to High Camp 3600m, 5-6 hours, overnight at lodge (B/L/D). Day 05: High Camp day trip to Mardi Himal West Base Camp and return to High Camp 6-9 hours (B/L/D). Day 07: Landruk to Pokhara 6-7 hours trekking to Nayapul, and one and half an hour drive to Pokhara or you can trek to Phedi (as same as day 02) 6-7 hours and drive to Pokhara half an hour (B/L). Day 08: Pokhara to Kathmandu by tourist bus 6 hours drive, 200km overnight hotel end your trip (B). Kathmandu to Pokhara and Kathmandu by Tourist bus. Pokhara to Trek start and end to Pokhara by taxi/ car. If choose camping trek we will provide all necessary kitchen equipment, staffs, tents etc.